Leah Goldin, mother of Hadar Goldin, relates to heated Knesset discussion on Operation Protective Edge. 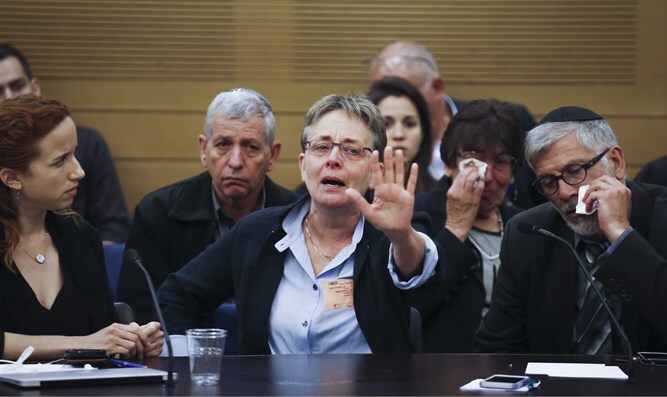 Leah Goldin, mother of fallen soldier Hadar Goldin whose body is being held by Hamas in Gaza along with that of Oron Shaul, spoke on Wednesday evening about the heated discussion at the Knesset’s State Control Committee on the State Comptroller’s report about Operation Protective Edge. The discussion became emotional and heated when Goldin burst into tears and accused Prime Minister Binyamin Netanyahu of turning the bereaved families “into the enemies of the people”. "I am not sorry that I came to the discussion, but I did not think it would take place in this manner," Goldin told Channel 10 News later on Wednesday, adding, "Red lines were crossed today and I am still in a state of emotional turmoil." "Two and a half years after Operation Protective Edge, the Cabinet finally decided to pressure Hamas to bring the soldiers back from the battlefield, but nothing happened. We must stop being afraid of Hamas. The Gilad Shalit deal led to the fact that terrorist prisoners were returned to Gaza and now they are the ones who control it...We have to change this equation, there is no other way,” said Goldin.